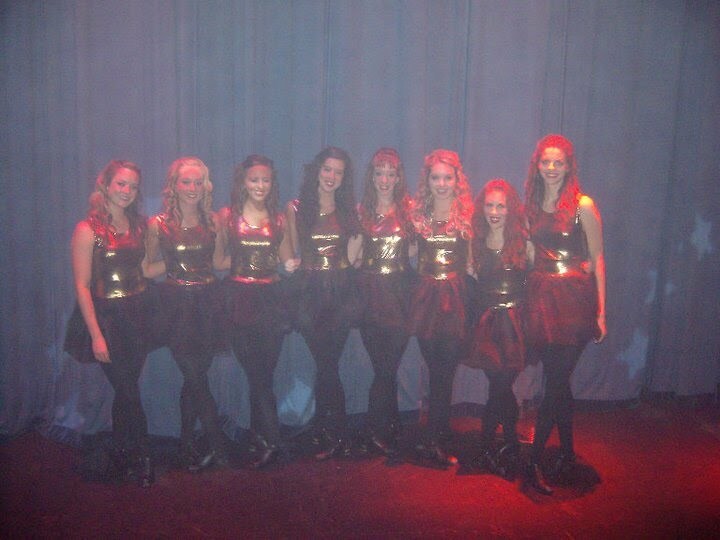 Performing with an Irish dance show – "In Love With the Dance"
Riverdance peaked in popularity when I was a little girl. It’s most likely the reason my U12 age group in major competitions years ago was split into Group A and B categories. Irish dance tours sparked huge interest in the competitive sport that we all know and love. This past May, I had the opportunity to get a firsthand look at the inner workings of a tour. I came out of retirement and joined the cast of In Love With the Dance for two shows in Illinois. Two other girls and I rehearsed with a cast that had been touring together for a few months, performed twice…and had blisters for about a month after that. I forgot how great of a workout Irish dance is. This particular cast, spanning from all over North America, were traveling through Canada and the U.S. by bus a few weeks earlier, performing for audiences that were captivated by the all-powerful grace of veteran Irish dancers. I heard tales from the tour of impossibly fast shoe changes (which I can now attest to) and could see that living and traveling together had turned the cast into a family. Performing with In Love With the Dance wasn’t all laughs, of course, as expectations were high. Rehearsals were an all-day affair. Ensuring that everyone was lined up, on time, the usual routine, was very important. The last time I was that nervous was when I was taking the stage in Ireland for the World Irish Dancing Championships. And the people filling the seats had paid money to see Irish dancers who knew what they were doing. Um, did I mention this was the first time I put hard shoes on in four years?! I was so scared! When the music started up for the first number I just saw lights. My feet were on autopilot as they somehow led me the in same direction as the line I was supposed to be in. Backstage yells of encouragement from the other cast members made me laugh and, soon enough, I was back in the groove of things. Getting back into that thrill performing gives you is just like jumping back into a pool and seeing if you can still swim. There’s a certain adrenaline rush from dancing in front of large audiences that Irish dancers love—and a tour lends a great dose of that. Watching the solo performances from lead dancers Jenny Bailey and Brian Donnelly had me wondering why I ever stopped dancing. Besides the injuries, I have nothing but great memories from the sport. I’ve always said I wanted to grow up and do something I love, but maybe the key is to not grow up and revert to what I’ve always enjoyed. After the show, Jenny asked me if I was ready to try out for the next tour. Not a bad idea to take a year off after college graduation and try my hand at the professional world of Irish dance, eh? Have you ever dreamed of performing in an Irish dance show? Which would you chose? Let us know!